The measuring instrument type TAND220A conforms to the new IEC 61620 standard This instrument is based on the so-called "low amplitude, low frequency, alternate square wave method" and permits accurate measurement of volume conductivity and relative permittivity. The measurement of volume conductivity in the range of 0.01 pS/m to 20'000 pS/m allows the use of this instrument for quality assessment of high resistive liquids even at ambient temperature. The TAND220A works with low voltage and low current levels and represents no danger at all for its operators. The liquid in the test cell is excited with a low amplitude (30 V) low frequency (0.5 Hz) alternate square wave voltage without any DC component (see figure 1). For determination of conductivity or tan?, the alternate square wave method is, by far, more sensitive than the classic bridge method. 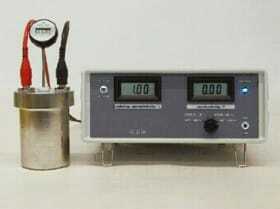 It permits the determination of conductivity values down to 0.01 pS/m respectively tan; values down to 1E-6 (at 50 Hz). This high sensitivity allows accurate measurements of conductivity and tan; at low temperatures and consequently the characterisation of liquids at room temperature can be carried out with confidence . The application of a square wave excitation voltage with low amplitude of only ±30 V permits the development of a test cell with simple design, easy to use and to clean. The compact test cell of the equipment is composed of only two parts, a container and an active part. Two coaxial electrodes (stainless steel) are attached on a cap (also stainless steel). This cap also supports two BNC connectors coupled to the two electrodes. The electrodes possess a clean, polished surface. The vessel and the active part can be cleaned according to procedures described in the appendix A. It is not possible and not necessary to disassemble the active part for cleaning purposes. The required amount of liquid for a test is about 210 ml. To reach this amount, fill in the liquid to be tested up to 23 mm from the top edge of the vessel. The temperature of the tested liquid can be determined by introducing the electronic thermometer in the cell through the cover orifice. A typical application of TAND220A is the quality assessment of mineral oil used in high voltage apparatus e.g. power and instrument transformers, bushings, capacitors, etc. Several investigations have demonstrated that the conductivity of oil is influenced by impurities and ionic components, which are introduced or produced in it. Therefore, the oilconductivity characterizes well the quality of oil. Further, it has been shown that the moisture in oil has no significant influence on its conductivity. The following values of conductivity given at ambient temperature are typical for a mineral oil in its different states of use.